Very nice and exclusive apartment of approximately 193 m2 with roof terrace, elevator, a guest house of approximately 52 m2 in the basement, 2 parking spaces and a storage room. This unique apartment is located in the new development project “Veenpark”. which was completed in 2018, consisting of 6 apartments spread over 2 villas built in detailed 1930s style. 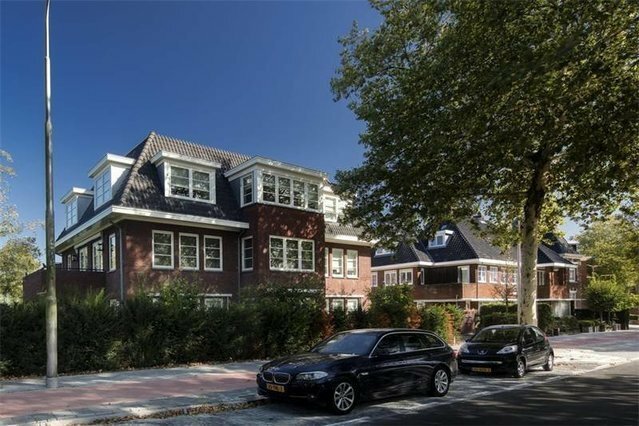 Not only the location directly behind the Amsterdamse Bos with all its facilities is very special, the location in relation to the Stadshart shopping center, the Zuidas and Amsterdam is also very favorable. You certainly have easy access to several roads, within a few minutes you are on the A10, A9, or A4. Also Schiphol can be reached this way. By car you enter the closed and green courtyard and the parking garage. Via the communal entrance on the ground floor of the front villa you can reach both the elevator and the stairs to the second and top floor. The apartment is very light and spacious. This is due to the windows around and the ceiling height up to 3.80 m high. On both sides of the entrance you will find the 2 spacious bedrooms, each with its own bathroom ensuite and fitted wardrobes. The first bathroom has a bath, separate walk-in shower, double sink and toilet. The second bathroom has a bath, double walk-in shower, double sink and toilet. At the front you can find the spacious living space. The dining area in the middle with bay window forms the natural separation between the spacious sitting area with gas fireplace and the luxury kitchen with utility room with all it’s appliances. In the beautiful closet wall in the hall are an extra guest toilet and a storage cupboard with washing machine connection situated, hidden away from view. Through the internal staircase is the spacious landing on the third floor with double doors to reach the sheltered roof terrace. Here is enough room for a work angle. The guest house in the basement is just as luxuriously finished as the house above. The studio has a spacious open kitchen, a bathroom with a shower, with sink and a separate toilet. The two parking spaces are located on the courtyard and in the parking garage. In the parking garage you also have a separate storage room. - New construction completed this year. - Underfloor heating and cooling. - NEN measurement report available: 192.75 m2 of living space, 21.28 m2 of building-related outdoor space and 4.72 m2 of external storage space. The guest house is 51.88 m2 and has the destination storage.